The beginning of this premier 10K Run was recorded by the photographer seen in the lower left hand corner of the following image rvmann.com/artwork/2550362-10K-run-Veni?. Notice, that I was hanging from the fire escape by a tree climbers belt with the tripod mounted camera. I could record the start of the race then swing around and capture it leaving while not having to change positions. Like coming and going all during the pitter patter of feet that sounded like a flowing river rvmann.com/artwork/2550362-10K-run-Veni? 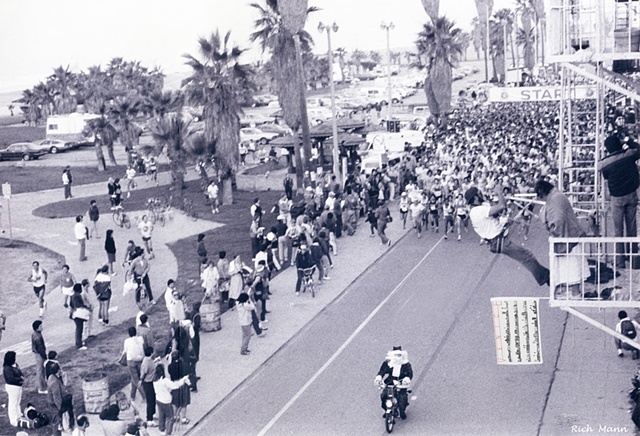 Also, notice the only flag that Venice ever displayed, seen below me in white, that also represents the Boardwalk, as the runners were led by Santa Claus riding a Moped motorcycle.